becomes necessary to follow the evolution of that service since its inception. The tradition of Marines serving on board ships and landing on foreign shores dates back to the Revolutionary War. Throughout the Nineteenth Century, as occasion demanded and as dictated by the expanding interests of the United States, Marines distinguished themselves in operations on the seas or on foreign soil. Their exploits became legend at home and abroad; their existence and immediate availability in time of need became a factor in the foreign policy of the United States. To those viewing this country with unfriendly eyes, they became a force to be reckoned with. Even though, from the very inception of the Corps, ship-based Marines had made landings on enemy soil, real interest in amphibious warfare, as the term has since become widely known, did not develop until the Spanish-American War. At that time, both in Cuba and in the Philippines, a military force was needed to accompany the fleet to seize and hold advanced bases.4 Once this requirement had been established, The General Board of the Navy recommended the activation of a permanent base force. In November 1901, the Secretary of the Navy ordered the Commandant of the Marine Corps to organize a battalion for such advance base work. Instruction of Marines in this special activity began in 1902 at Newport, Rhode Island and Annapolis, Maryland. The training covered field fortifications, transportation of guns, construction of telegraph and telephone lines, and the planting of land mines. Of necessity, it was limited in scope, since the Marine Corps was fully occupied with other commitments abroad. Amphibious landing exercises were not held until 1914. Advance base training was shifted to New London, Connecticut in 1910 and to Philadelphia a year later. There it remained until 1920, when the activity moved to Quantico, Virginia. During World War I, the Marine Corps gained little combat experience in advance base warfare despite the existence of an Advance Base Force of more than 6,000 officers and men. The big battles of that war were fought on terra firma by large land armies locked for weeks or months in trench warfare that featured little movement. As in the past, Marines distinguished themselves on the battlefield, but the war they waged was that of the foot soldier. Since armies tend to refight battles of a previous war in peacetime in anticipation of the next conflict, instruction in the years following World War I emphasized the Army type of fighting that had become the trademark of that war. As a result, emphasis in those years was on land warfare at the expense of amphibious training. During the immediate postwar period, the voices raised in support of the feasibility of amphibious warfare were crying in the wilderness. By mid-1921, at a time of isolationism and retrenchment, the strength of the U.S. Marine Corps diminished to 1,087 officers and 21,903 enlisted men,6 a figure that was to drop even lower during the late 1920s and early 1930s. In the wake of demobilization the entire Corps was suffering from a letdown that invariably follows the return of a military organization to peacetime conditions. Most of the men who had signed up for the emergency had returned to their civilian pursuits. Many wartime officers had left the service and wholesale demotions in rank had become necessary, while recruiting was slow. The status of the officers who remained was uncertain and, as with the other Services, retrenchment and budgetary restrictions obscured the peacetime mission and status of the Corps. of naval bases in the Pacific west of the Hawaiian Islands; the other was the emergence of the Japanese presence in the Pacific, one of the consequences of the Treaty of Versailles, the bitter fruits of which were not to be confined to Europe alone. Having jumped on the Allied bandwagon just in time in World War I, Japan was free to consolidate and expand her foothold in the Central and Western Pacific. Among the first to recognize that expansion-minded Japan might well become a major adversary in any future war was Major Earl H. Ellis, a Marine Corps officer who by 1921 foresaw the possibility that the United States some day would have to seize bases from Japan in the Marshall, Caroline, and Palau Islands.8 Though high-ranking Marines, including the Commandant, Major General John A. Lejeune, shared his views, little concrete planning could be accomplished at the time. Major Ellis went on to write an ingenious plan for "Advanced Base Operations in Micronesia," which was to become a partial blueprint for American operations in the Central Pacific 20 years later during World War II. But Major Ellis was far ahead of his time and was destined to perish obscurely in the Palaus-either on a personal or semi-official reconnaissance-‹before his seeds could fall on fertile soil. saw a significant reduction in the number of Marines on foreign service; by early 1933 the last contingent had left Nicaragua. Immediately following the establishment of the 3,000-man Fleet Marine Force, the Marine Corps Schools at Quantico prepared an amphibious operations manual which set forth a philosophy of command relations, modern concepts, and techniques for a controlled ship-to-shore movement; possible means of ship-to-shore communications; doctrines for air support and naval gunfire; combat loading of troops and supplies; and basics of shore party organization. The finished guide was introduced as the Tentative Landing Operations Manual. Within four years, the manual was to be adopted by the Navy as official doctrine for all landing operations. Subsequently, with additional modifications, it also emerged as an Army Field Manual. In September 1935, Headquarters, Fleet Marine Force moved from Quantico to San Diego. At the same time, the Fleet Marine Force was organized into two brigades. The 1st Brigade was stationed at Quantico, while the 2d moved to the Marine Corps Base, San Diego. In order to have available an organization that could cope with the testing of equipment that was to be used for amphibious warfare, a Marine Corps Equipment Board was established at Quantico, which subsequently was instrumental in the development of the amphibian tractor. would move an assault force from the troop transports to its objective. 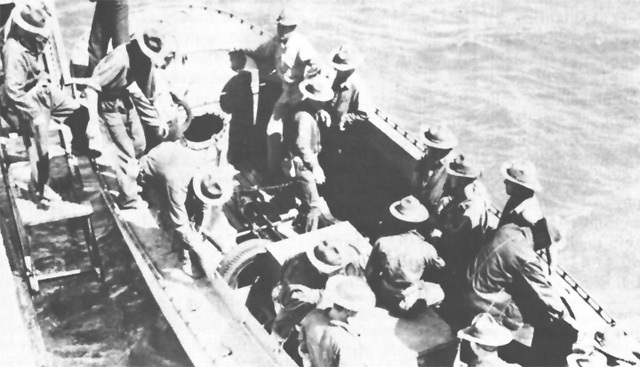 Following extensive experimentation and controversy, Higgins-designed landing craft were found to be best suited to this purpose, and their manufacture in large numbers was initiated. When World War II broke out in Europe in September 1939, the Marine Corps, with a strength of less than 20,000 men, already had laid a sound basis for its subsequent expansion. This got under way when President Roosevelt proclaimed a state of limited national emergency and, in keeping with a general expansion of the armed forces, increased Marine Corps strength to 25,000. While the war in Europe ran its course and a victorious German Army overran Poland, Denmark, Norway, the Low Countries, and finally France‹in the end placing Great Britain under threat of imminent invasion‹the Marine Corps continued to train for a war in which the United States might eventually become involved. In the autumn of 1940, the 1st Marine Brigade departed from Quantico for Cuba and subsequently underwent extensive amphibious training in the West Indies. On 1 February 1941, the newly organized 7th Marines joined the 1st Brigade at Culebra, where the two combined units were designated as the 1st Marine Division, commanded by Holland M. Smith, who up to this time had headed the 1st Marine Brigade. Also on 1 February 1941, the 2d Brigade was designated the 2d Marine Division. It is interesting to note that at the very threshold of the greatest expansion the Marine Corps had even seen, the Fleet Marine Force was temporarily disbanded. This development resulted from war plans that called for the establishment of a two-divisional expeditionary force with each fleet for the specific purpose of carrying out amphibious assaults as required. These amphibious forces were to be further supplemented by an additional division per fleet obtained from the Army and to be trained by the Marines. Upon the recommendation of the Commandant of the Marine Corps, Major General Thomas Holcomb, the 1st and 2d Marine Divisions were assigned to the Atlantic and Pacific Fleets respectively, while the defense battalions of the Fleet Marine Force, which had been created in 1939 for advance base service, were distributed to other commands. six months before the attack on Pearl Harbor, certain organizational changes occurred. Major General Holland M. Smith on 13 June relinquished command of the 1st Marine Division and became Commanding General of I Corps (Provisional), U. S. Atlantic Fleet, composed of the 1st Marine Division and the Army's 1st Infantry Division. Two weeks later, the organization was redesignated as Task Force 18, U.S. Atlantic Fleet, followed within two days, on 28 July 1941, by a redesignation to the 1st Joint Training Force, U. S. Atlantic Fleet, By mid-August 1941, the title had been changed again to Atlantic Amphibious Force, and in late October of the same year, the organization became the Amphibious Force, Atlantic Fleet. This designation was retained until 3 March 1942, at which time the command received yet another title, that of Amphibious Corps, Atlantic Fleet.13 Significantly, regardless of this multitude of titles bestowed upon the organization, there was a continuity of command if not in name, and General Holland Smith continued to preside at each consecutive baptism. on Oahu at Ewa.17 Marine defense battalions at the outbreak of the war were stationed on Midway, Palmyra, and Johnston Islands, and on Wake. Other detachments held forward outposts in the Pacific in American Samoa, at Subic Bay, Luzon, and in the Aleutians. As the expansion of the armed forces of the United States continued and was further accelerated during 1942, a concept was adopted which charged the Army with primary responsibility in the Atlantic, while the Navy was to reign in the Pacific. As a result of this concept, amphibious training activities on the East Coast of the United States generally became the responsibility of the Army, while similar activities on the West Coast were assigned to the Marine Corps. In line with this thinking, the 2d Joint Training Force had been created on 1 November 1941 at Camp Elliott near San Diego. This force had been planned as a joint Marine-Army training organization, paralleling General Holland Smith's setup on the East Coast. There were similar gyrations in name and title to those the Marine establishment on the East Coast had experienced. On 10 February 1942, Major General Clayton B. Vogel's command became the Amphibious Force, U. S. Pacific Fleet, to be rechristened as Amphibious Corps, Pacific Fleet, less than two months later. (See Chart 1.) Effective 3 August 1942, General Vogel, who up to this time had also acted as the senior Fleet Marine Force commander at San Diego, was placed in command of all Fleet Marine Force units, both ground and air, in the 11th Naval District. the West Coast to assume command of the IMAC in the South Pacific. Despite the tortuous and somewhat confusing road that the Marine Corps command organization had travelled, an effective command organization was beginning to emerge by the middle of 1942, though many difficulties remained to be overcome. In his capacity as Commanding General, Amphibious Corps, Pacific Fleet, General Smith was responsible for the organization and training of Fleet Marine Force units as they became available for employment with the Amphibious Force, Pacific Fleet. At the same time, in his dual capacity as Commanding General, Fleet Marine Force, San Diego Area, General Smith was charged with the administration of training activities at San Diego, Camp Pendleton, and Camp Dunlap, as well as command of Fleet Marine Force units that were not specifically assigned to the Corps. Since the Amphibious Corps was a joint command and consisted of U. S. Army as well as Marine units, its primary mission for a number of months was to train Army units, specifically for operations in the Aleutians. Meanwhile, American troops were pouring into the Pacific Area in ever increasing numbers, making it necessary for the I Marine Amphibious Corps, originally planned only as an administrative command for Marine units, to assume tactical functions. By late 1943, augmentation of the Pacific Fleet and availability of manpower made possible the initiation of the Central Pacific offensive, whose purpose was to strike out westward across the Pacific along the most direct route to Japan. Pursuant to this mission, Vice Admiral Raymond A. Spruance became commander of the Central Pacific Force and the Fifth Fleet. In August 1943, the Fifth Amphibious Force was organized under Rear Admiral Richmond K. Turner, and later that month the Amphibious Corps, Pacific Fleet, was redesignated as the V Amphibious Corps (VAC ), with General Holland Smith in command. Even though the newly-created VAC directly succeeded the Amphibious Corps, Pacific Fleet, there was a major difference in its mission, which became a dual one. First, the organization was to constitute an administrative command with control of Marine units in the Central Pacific. Secondly, it had the tactical mission of directing amphibious assaults of both Marine and U. S. Army troops. At the time of these administrative changes, the new organization turned over its responsibility for amphibious training on the West Coast of the United States to a newly established Troop Training Unit, Amphibious Training Command, Pacific Fleet. In September 1943, VAC moved to Hawaii, where preparations were then in full swing for the invasion of the Gilbert Islands. The Joint Chiefs of Staff had decided as early as 1942 to split command in the Pacific Theater between the Southwest Pacific Area under General MacArthur and the Pacific Ocean Areas under Admiral Nimitz. Until 1944, most FMF units had served in the Southwest Pacific under MacArthur, but the new Central Pacific drive demanded trained amphibious troops and the Navy wanted Marines for the assault role. Effective 25 March 1944, the I Marine Amphibious Corps passed to the command of Admiral Nimitz, who now controlled it in addition to the V Amphibious Corps. On 29 March 1944 the Commander in Chief, United States Fleet, authorized the Commanding General, VAC, to exercise, as an additional duty, complete administrative control and logistical responsibility for all Fleet Marine Force units committed for operations in the Central Pacific.21 General Alexander A. Vandegrift, who had been appointed as Commandant of the Marine Corps on 1 January, was on an inspection tour in Hawaii when the above authorization arrived and on this occasion proposed the establishment of an Administrative Command, VAC. The latter was to function just below VAC with responsibility for the administrative work of all Pacific Fleet Marine Force units concerning supply, evacuation, sanitation, construction, salvage, personnel management, quartering and general supervision of censorship. Further, it was to handle the command and administration of all Fleet Marine Force units in the Pacific which remained at bases during combat operations or which were assigned by the Commanding General, VAC. Finally, the Administrative Command was to supervise the routine administrative activity of units that would normally be handled by the rear echelon of the Corps headquarters. Under the reorganization, the newly created unit consisted of Headquarters, Marine Administrative Command, VAC, and Marine Supply Service, VAC. At the same time that the organizational changes became effective, the Commanding General, I Marine Amphibious Corps, was relieved of his administrative functions, retaining only those of a tactical nature, unless otherwise directed by the Commanding General, VAC. Under the new setup, the functions of the Supply Service, IMAC and those of the Marine Supply Service, VAC, were consolidated. While the above reorganization and consolidation no doubt were steps in the right direction, it soon became evident that additional changes were necessary as a consequence of the constantly changing tactical situation in the Pacific Theater. By April 1944 the Fleet Marine Force units in the theater consisted of four divisions, a brigade which lacked only a regimental combat team in order to constitute a full division, corps troops and a steadily expanding Supply Service. The 5th Marine Division was still being trained and equipped in the Continental United States, but its arrival in the theater was also expected around the turn of 1944-1945.
two tactical staffs. Organization of the staff took place at Pearl Harbor on 12 April 1944, on the same date that the Marine Administrative Command was formed. For all practical purposes, a Headquarters, Fleet Marine Force, Pacific was now in existence in all respects except for the name. Events occurring during the spring of 1944 were designed to correct this deficiency. On 27 May 1944, the Commander in Chief, U. S. Fleet queried the Commander in Chief, U. S. Pacific Fleet with respect to the desirability of creating a Headquarters, Fleet Marine Force, Pacific Ocean Areas, under General Holland Smith. In reply, Admiral Nimitz expressed his concurrence and recommended that the change become effective upon completion of the assault phase of the campaign in the Marianas. As far as the organizational structure was concerned, Admiral Nimitz recommended that the Fleet Marine Force, Pacific Ocean Areas, consist of a headquarters with the IIIAC, the VAC, and the Administrative Command, Fleet Marine Force, Pacific Ocean Areas, as subordinate units. Since at the time General Holland Smith was participating in the Saipan-Tinian campaign as Commanding General, VAC, the Commander in Chief, Pacific Ocean Areas directed that in his absence the Commanding General, Marine Administrative Command, Fleet Marine Force, Pacific, assume additional duty as Deputy Commander, Fleet Marine Force, Pacific. Upon his return from the Marianas, General Smith assumed command of Fleet Marine Force, Pacific. On 24 August 1944 Headquarters, Administrative Command, Fleet Marine Force, Pacific, was redesignated Provisional Headquarters, Fleet Marine Force, Pacific.25 Subordinate units of the Administrative Command, Fleet Marine Force, Pacific were redesignated units of Fleet Marine Force, Pacific. Headquarters and Service Battalion, Administrative Command, Fleet Marine Force, Pacific, also underwent a change in that it became Provisional Headquarters and Service Battalion, Fleet Marine Force, Pacific. now assumed those functions previously assigned to the Administrative Command. The far-reaching changes in the organizational structure of the Marine Corps found their echo in the status of the Fleet Marine Force aviation units in the Pacific, which also was subject to modification. 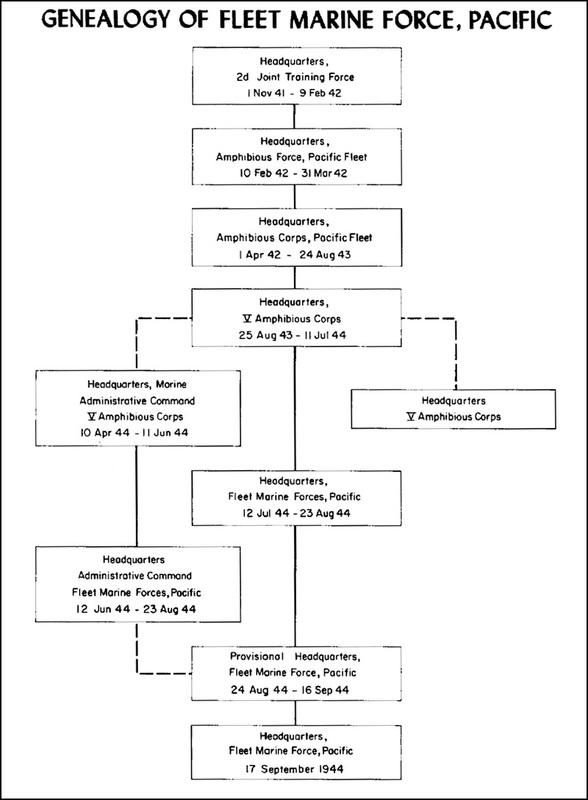 On 7 September 1944, General Vandegrift acted on instructions received from Admiral King and ordered deletion of FMF Air Pacific from the initial organizational chart of 31 August, leaving the command status of aviation units to be clarified at a later date. On 16 September, Marine Aircraft Wings, Pacific, was redesignated as Aircraft, Fleet Marine Force, Pacific. With reference to the aviation units, the same letter spelled out the status of Aircraft, FMFPac. The latter organization was defined as a major unit of FMFPac. Its Commanding General was charged with performing type-command functions under the Commanding General, FMFPac within the latter's field of responsibility. In aviation matters, the Commanding General, Aircraft, FMFPac, was to perform type-command functions under the Commander, Air Force, Pacific Fleet. Operational control of Aircraft, FMFPac tactical units was to remain with the Commander, Air Force, Pacific Fleet, unless such units were otherwise assigned. Even though the letter more clearly spelled out the mission and responsibilities of FMFPac, and as such signified a large step forward for the Marine Corps command structure, it still fell short of one objective. There now existed an amphibious organization in the Pacific which had come a very long way from the basic structure that had existed at the time of the Pearl Harbor attack. Nevertheless, the new establishment still had not attained the status of a tactical field army type of headquarters that General Smith had envisioned and proposed in March 1944 and which the Commandant had previously endorsed. A gap in the doorway had been opened through the provision that the Commanding General, FMFPac, could at times act as a task force commander in combat operations, but at this stage the door was still far from ajar. Assurances were provided that General Holland Smith in his capacity as Commanding General, FMFPac, would retain responsibility for conducting combat operations as a task force commander when directed to do so. In practice, he was able to exercise such command only during the Iwo Jima operation in February-March 1945. Prior to the end of World War II, the status and organizational structure of Headquarters, FMFPac remained essentially unchanged. The only other major change was the redesignation of the Supply Service, FMFPac, as Service Command, FMFPac, which became effective on 1 June 1945. At the time of the Japanese surrender, FMFPac consisted of the Service Command, FMFPac, the III and V Amphibious Corps, composed of six Marine divisions, and Aircraft, FMFPac consisting of four Marine Aircraft Wings and Marine Fleet Air, West Coast. The American drive across the Pacific to the doorstep of Japan rendered acute the question of the forward displacement of Headquarters, FMFPac. It was proposed initially to move elements of Headquarters, FMFPac, from Hawaii to Guam in the Marianas. A study of the question brought out the fact that there was a continuing necessity for certain sections of General Smith's headquarters to maintain liaison with Headquarters, Commander in Chief, Pacific. There was an additional requirement for other headquarters sections to advise the Commanding General, FMFPac, in the forward area. Basically, the latter would comprise the personnel who would act as the operating staff of the Fleet Marine Force in the field. As of December 1944, it was envisioned that major portions of the G-2 and G-4 Sections, Headquarters, FMFPac, would remain in Hawaii, since the Joint Intelligence Center, POA, and most of the logistical operating sections would also remain there. The Deputy Commander, FMFPac, was to remain at Pearl Harbor, and all staff sections were to be represented on his staff, so that normal administrative functions as an area command could be retained. Since a Field Service Command was already present on Guam, no further displacement of Headquarters, Supply Service, FMFPac, was anticipated. subsequent to 1 July. However, inasmuch as the primary function of the Commanding General, FMFPac, was that of an administrative commander, General Smith felt that it would not be feasible for the main body of the administrative staff to remain in Hawaii while he himself relocated to Guam. Since he was divorced from operational duties, the bulk of the daily decisions dealt with questions of personnel and logistics whose solution required immediate access to all of the records retained in Headquarters, FMFPac. The physical separation of the major portion of his staff from these records would, for all practical purposes, strip him of his primary function as administrative commander of FMFPac while delegating the command of that headquarters to the Deputy Commander, FMFPac. An additional factor mitigating against the forward displacement of FMFPac was the lack of headquarters facilities on Guam. There was a critical shortage of engineers and it was felt while some construction could be completed for subordinate elements of FMFPac with limited space requirements, adequate housing for the Headquarters would not be available on Guam for an indefinite period. In view of this problem, the Commanding General, Fleet Marine Force, Pacific reversed his thinking as to the forward displacement of his headquarters and requested that his earlier recommendation to this effect be held in abeyance, pending a major change in the overall situation. In July 1945, following the assumption of the command of FMFPac by Lieutenant General Roy S. Geiger on 3 July, action on the forward move of the headquarters was again initiated. It was tentatively planned that the forward headquarters would consist of the commanding general and a small operating staff and that initially the bulk of the administrative work would be handled in Hawaii under the Deputy Commander, FMFPac. As before, Guam was to serve as the forward location. Initial housekeeping support at the forward headquarters was to be provided by small advance echelons of the Headquarters and Service Battalion, the Signal Battalion, the Marine Detachment (Provisional), Marianas Area, and the Transient Center, Marianas Area. Subsequent echelons were to displace forward over an extended period of time. In order to provide for an uninterrupted handling of the workload, it was anticipated that certain Headquarters files and records would have to be duplicated and that certain special staff sections would have to be combined with appropriate general staff sections at either location. echelon which was to include General Geiger, the Chief of Staff, G-3 Section, and appropriate general and special staff representatives, was slated to be established on Guam on or about 3 September 1945.32 The main body of Headquarters, FMFPac was to remain in Hawaii under the Deputy Commander, FMFPac, as stipulated in the earlier plan. During the absence of General Geiger, the Deputy Commander was to exercise the former's administrative functions, in addition to controlling and supervising units and the staff groups remaining in Hawaii. The division of staff functions between the forward and rear echelon was to be handled in such a way that operational planning, allocation of troop units, training directives, organization, and troop movements would all be taken care of on Guam while personnel administration, allocation of replacement drafts, intelligence functions, procurement of maps and aerial photographs, supply and evacuation, transportation, and other administrative matters both special and routine would be the responsibility of the Deputy Commander. The end of the war forestalled the forward displacement of FMFPac, and the headquarters remained at Pearl Harbor.33 The immediate problems inherent in the invasion of Japan, for which planning was well under way by the time of the Japanese surrender, could now be shelved as the uncontested occupation of the Home Islands became a reality. In nearly four years of global warfare, the Marine Corps had succeeded in putting an untried concept of amphibious warfare to the acid test. 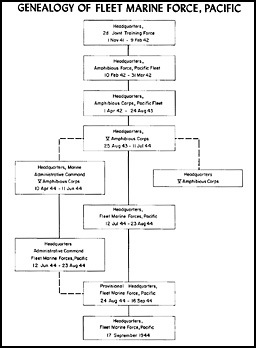 The evolution of the administrative structure of the FMFPac represented a small but vital link in the chain of events that led from prewar experimentation with the ways and means of amphibious assault on the peaceful shores of islands in the Caribbean to such places as Tarawa, Saipan, Tinian, Guam, Iwo Jima, and Okinawa. To make these assaults feasible required not only vast quantities of materiel and men trained in their use, but also an efficient organization that could assure that both were available when and where needed. The twists and turns taken during the evolution of the Fleet Marine Force are but a reflection of the ever-changing war situation that called for a highly flexible command organization. Thus, the development of the Fleet Marine Force saw its beginnings before war came to the United States; it was destined to continue long after the last shot had been fired. The lessons of that war, many of them learned by trial and error, were to become an invaluable asset in the overall offensive and defensive capability of the United States, to be available as needed for the use of future generations. 1. Unless otherwise noted, the material in this chapter is derived from: Administrative History of Fleet Marine Force, Pacific, 10Apr44-31Aug45, dtd 15May46, hereafter FMFPac Administrative History; Historical Outline of the Development of Fleet Marine Force, Pacific, 1941-1950 (Preliminary), HQMC, n.d., hereafter The Development of FMFPac; LtCol Frank O. Hough, Maj Verle E. Ludwig, and Henry I. Shaw, Jr., Pearl Harbor to Guadalcanal--History of U.S. Marine Corps Operations in World War II, v. I (Washington: HistBr, G-3, HQMC, 1958), hereafter Hough, Ludwig, and Shaw, Pearl Harbor to Guadalcanal; Henry I. Shaw, Jr., Bernard C. Nalty, and Edwin T. Turnbladh, Central Pacific Drive--History of U.S. Marine Corps Operations in World War II, v. III (Washington: HistBr, G-3, HQMC, 1966), hereafter Shaw, Nalty, and Turnbladh, Central Pacific Drive; Maj Edwin N. McClellan, The United States in the World War (Washington: HistBr, G-3, HQMC, 1968 Reprint of 1920 Edition) ; General Holland M. Smith and Percy Finch, Coral and Brass (New York: Charles Scribners Sons, 1949), hereafter Smith and Finch, Coral and Brass, used with permission; Jeter A. Isely and Philip Crowl, The U S. Marines and Amphibious War, Its Theory and Its Practice in the Pacific (Princeton: Princeton University Press, 1951), hereafter Isely and Crowl, U.S. Marines and Amphibious War; Clyde H. Metcalf, A History of the United States Marine Corps (New York: G. P. Putnam's Sons, 1939), hereafter Metcalf, A History of the U.S. Marine Corps; Robert D. Heinl, Jr., Soldiers of the Sea--The United States Marine Corps, 1775-1962 (Annapolis: United States Naval Institute, 1962), hereafter Heinl, Soldiers of the Sea. 2. Additional information in this section is derived from: William H. Russell, "The Genesis of FMF Doctrine: 1879-1899," Marine Corps Gazette, v. 35, nos. 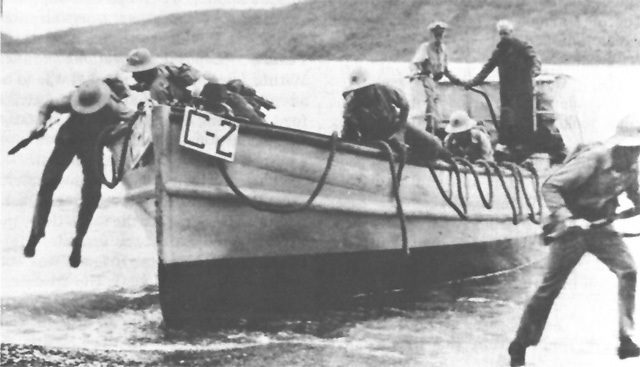 4-7 (Apr-July 1951); LtGen Holland M. Smith, "The Development of Amphibious Tactics in the U.S. Navy," in Marine Corps Gazette, v. 30, nos. 6-10 (Jun-Oct 1946). 3. Isely and Crowl, U.S. Marines and Amphibious War, chaps. 1-2. 4. For a detailed account of Marine involvement in shaping the concept of amphibious warfare, see Hough, Ludwig, and Shaw, Pearl Harbor to Guadalcanal, Pt. I. 5. Smith and Finch, Coral and Brass, pp. 47-54. 6. Historical Statistics of the United States-Colonial Times to 1957 (Washington: Department of Commerce, Bureau of the Census, GPO, 1961), hereafter U.S. Historical Statistics. 7. Recalling this period many years later, one Marine was to comment: "Prior to World War II, the Marine Corps was a great "make do" outfit despite extremely limited means. Where else could you find men who, after four years, shipped over for PFC?" Col R.M. Baker ltr to Head, Hist Br, G-3 Div, HQMC, dtd 21Jul69, in FMFPac History Comment File. 8. As a captain prior to World War I, Ellis had already written on "The Security of Advanced Bases and Advanced Base Operations" (IntelSec, DivOps and Trng Files, HistDiv, HQMC). 9. Additional material in this section is derived from: MajGen John H. Russell, "The Birth of the FMF," U.S. Naval Institute Proceedings, v. 2, no. 515 (Jan 1946). 10. Navy Dept GO No. 241, as cited in The Development of FMFPac, pp. 6-7. 11. Metcalf, A History of the U. S. Marine Corps, p. 550. 12. Smith and Finch, Coral and Brass, p. 72. 14. U.S. Historical Statistics, p. 736. 16. Report of General Board on Expansion of U.S. Marine Corps, G.B. No. 432, Serial No. 139, dtd 7 May 1941, in Organization and Expansion of the USMC, 1940s (OAB, NHD). 17. The growth of Marine Corps aviation and the evolution of its command organization will be dealt with in a separate chapter. 18. Additional material in this section is derived from: BGen D.A.D. Ogden (AUS), "Amphibious Operations," Reprint of Lecture at the U. S. Army Engineer School, Ft. Belvoir, Va.: 15Mar49. 19. FMFPac Administrative History, p. 11. 20. Smith and Finch, Coral and Brass, p. 154. 21. CominCh ltr ser 001015, dtd 29Mar44 as cited in FMFPac Administrative History, p. 11. 22. VAC GO No. 53-44, dtd 6Apr44, as cited in FMFPac Administrative History, p. 14. 23. The redesignation which became effective on 15 April 1944, reflected the fact that the corps, like VAC, was a command including troops of all Services, not just Marines. 24. FMFPac Administrative History, p. 15. 25. FMFPac SpecO No. 2-44, dtd 23Aug44. 26. CMC ltr to CG, FMFPac, Serial O03E23944, dtd 31Aug44. 27. FMFPac GO No. 12-44, dtd 18Sep44. 29. Pacific Fleet Letter 53L-44, dtd 110ct44. 30. FMFPac Administrative History, pp. 19-22, 33-34. 32. FMFPac GO No. 75-45, dtd 30Aug45. 33. The Japanese surrender voided the imminent move of Headquarters, FMFPac to Guam. Detailed notes pertaining to this move for the period 12-27Aug45 are contained in LtGen Merwin H. Silverthorn ltr to HistBr, G-3 Div, HQMC, dtd 20Jun69, in FMFPac History Comment File.